Plans have been revealed for a £17m redevelopment of Coventry's city centre that councillors say would restore the intention of its post-war architecture. The designs for the Upper Precinct would involve the removal of escalators and a ramp that, it is claimed, block views of the ruined cathedral's spire. The plans, which have yet to be approved, would also see the creation of more student accommodation. If granted permission, work would begin in summer 2018. 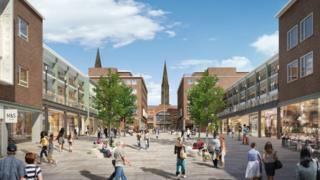 The plans form part of three redevelopment proposals for Coventry's city centre, including upgrades to the Cathedral Lanes shopping centre and work to the south of the city centre. Councillors said they hoped the precinct development would mean the clean line of vision to the city's old cathedral was restored, as was intended by post-war planner Sir Donald Gibson. Developers the Shearer Property Group said the changes, which also include a new shopping centre entrance and new student accommodation on the precinct's upper storeys, were "exciting". Who was Sir Donald Gibson? Jim O'Boyle, from the city council, said there was "no love" for the precinct's escalators. "People have been telling us for years that they would like them removed," he said. "This proposed work will mean we get the best of the original Gibson plan back, alongside some modern additions. "Hopefully these changes, if approved by planning, will help to attract new shops and restaurants to the area and this work will complement the bigger regeneration plan for City Centre South." Rob Orland, who runs the Historic Coventry website, said: "In my opinion, any plan to remove that escalator certainly sounds like a step in the right direction, as from ground level it does block the view towards Broadgate, which appears to have been central to Gibson's wartime plan."